R O M E, Oct. 25 — Afghanistan has again established itself as the world's largest opium poppy producer this year, with growers taking advantage of a power vacuum during the U.S.-led war and the collapse of the Taliban regime, the U.N. drug control agency said Friday. This year's production follows a sharp decline in 2001, when the Taliban enforced a ban on poppy cultivation, the United Nations Office for Drug Control and Crime Prevention said in a report released in Rome. The agency, however, expressed support for an eradication program launched earlier this year by Afghan President Hamid Karzai, and called on the international community to step up its support for the government campaign. "These figures are not the manifestation of a failure of Afghan authorities or of the international drug control efforts," the agency's executive director, Antonio Maria Costa, said. "The planting took place during the total collapse of law and order in the autumn of 2001." Opium is the raw material of heroin. The total opium production this year has been estimated at about 3,400 tons, compared with 185 tons in 2001 the result of the Taliban ban. The figure is also above preliminary assessments, which had projected this year's production at around 2,500 tons. Revenue for each of the 250,000 families involved in poppy production is estimated at about $3,000 to $4,000 a year, Costa said. The U.N. survey found opium poppy cultivation in 24 of the 32 Afghan provinces, but said that some 95 percent of it was concentrated in five provinces, traditionally the largest-poppy growing areas: northern Badakhshan, eastern Nangarhar, central Uruzgan and southern Helmand and Kandahar. The report said this year's increase was also the result of cultivation in more productive, irrigated land in southern and eastern Afghanistan. The weather also has improved after years of drought, the report said. The U.N. agency has conducted annual opium surveys in Afghanistan since 1994. Because of security concerns, this year's report was based on satellite images enhanced by ground verification, the agency said. Costa said that prospects for this year's planting next year's crop are still uncertain. Planting starts in the fall and goes through December. "Farmers are not sure they will go unpunished as they did last year," he said. In the 1990s Afghanistan was the world's largest opium producer. In the late 1990s, it was supplying 70 percent of the world's opium. 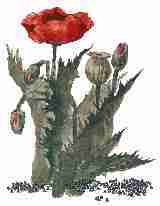 Then, in 2000, the Taliban government banned poppy cultivation. But the U.S.-led war that ousted the Taliban late last year prompted Afghan farmers to plant poppy again on tens of thousands of acres. The nationwide eradication campaign was launched in April, when the government began offering farmers $500 an acre of destroyed poppy crops. Costa said Friday the international community and especially European countries which are a major destination of heroin originating in Afghanistan should help Afghans strengthen drug control and develop legal means of earning a livelihood.